Hit musical Fame is to be performed at Airedale Academy next week by a set of students who are no strangers to the limelight. 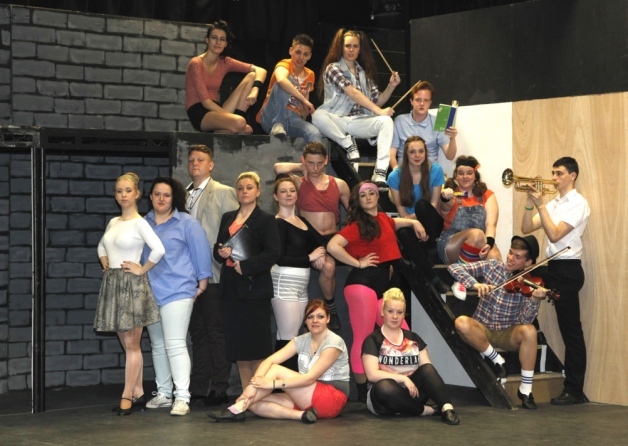 Sixth form performing arts students, who go by the name ‘The Cast’ will take to the stage on Wednesday, May 21 and Thursday, May 22 at the Castleford Phoenix Theatre, next to the school on Crewe Road. The academy’s artistic director, Tracey Bell says she hopes as many people as possible will come and watch the ‘exceptional’ show. The students recently returned from Disneyland, Paris after being chosen to perform a 30 minute show at the holiday resort. They also tour local primary schools with themed shows that support literacy initiatives and have appeared in educational films for the West Yorkshire Police. Ms Bell said: “These students work so very hard and have been a pleasure to teach, we are very, very proud of them . Every one of the students who applied to university has been successful in securing a place, and several of them have the luxury of choosing between three or more universities after being offered places at them all. The group is currently writing and creating a show highlighting the problem of online grooming on social media. Many of them are also performing in ‘Beat It,’ a charity fundraising event for Weston Park Cancer hospital, two days after Fame closes, alongside dancers from Channel 4’s Big Ballet. Tickets for Fame cost £8 for adults and £6 for concessions.